A lifetime of wear can rob even the healthiest smiles of a little luster. As a cosmetic dentist in Colorado Springs, our team at Four Seasons Dental Care offers a wide range of cosmetic dental care treatments designed to help repair, rejuvenate and revitalize your smile. 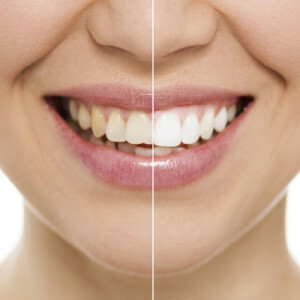 Teeth whitening has quickly become the most commonly performed cosmetic dental treatment in the U.S. One look at the spectacular results offered by teeth whitening and it’s easy to see why. Teeth discolored by the effects of a lifetime of eating and drinking tooth-staining substances, like red wine, can once again sparkle. At Four Seasons Dental Care, our dentists use Philips Professional Zoom Whitening to help restore the luster lost to patients’ teeth. With Philips Zoom, Dr. Matt and Dr. James can transform your teeth eight shades whiter after just one 45-minute treatment! Don’t underestimate the importance of a brilliantly bright smile. Schedule a consultation today with us to see if your teeth are healthy enough for Zoom whitening treatment. Porcelain veneers are thin pieces of porcelain used to recreate the natural look of teeth, while also providing the comparable strength and resilience of natural tooth enamel. Porcelain veneers often make the best choice for patients looking to make minor position alterations or to change tooth color, size and/or shape. Scheduling a consultation with Dr. Matt and Dr. James is the first step in determining whether porcelain veneers are right for you. It’s important to have a clear idea of what cosmetic changes you want made so that we have the correct information to work with. We will begin your consultation by conducting a smile analysis to determine what steps are needed to achieve your desired smile. To apply the veneer, a minuscule amount of tooth enamel must first be removed. In most cases, the amount removed is less than a millimeter. Removal of original tooth enamel is necessary to make room for the porcelain veneer to fit within the mouth and accurately restore the natural function of your teeth while creating a better looking aesthetic than the original tooth. It typically takes three office visits to complete the application of porcelain veneers. When a patient suffers structural damage to the size, shape or function of their teeth, a dental crown can be placed to cover a tooth and restore its functionality and its appearance to normal. 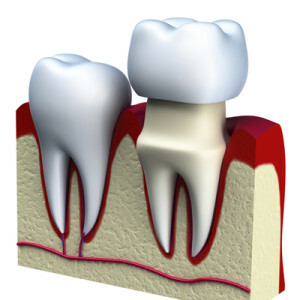 A dental crown can also help to strengthen a tooth that holds a large filling when not enough of the tooth’s natural structure remains in place. Additionally, crowns can be used to attach bridges, protect a weakened tooth from breaking or restore a tooth that has already broken. A crown also offers a great solution when covering badly misshapen or discolored teeth.